If you store files on an NTFS formatted drive that's separate from your Windows 7 operating system, and you move that drive to another computer, you may lose permission to write to that drive. That's because the previous system set access permissions for the drive. 1. In Windows Explorer right-click on the drive and in the popup menu that appears, select Properties. 2. 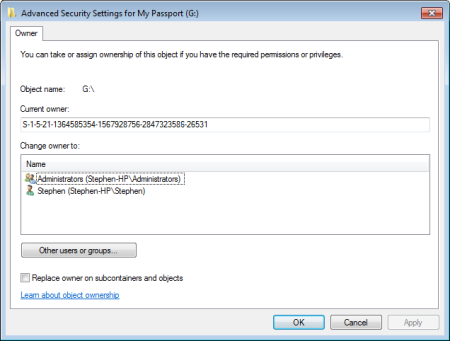 In the drive's Properties dialog box that appears, select the Security tab. 3. On the Security page, click on the [Advanced] button. 4. In the Advanced Security Settings dialog box click on the Owner tab. 5. On the Owner page, click on the [Edit] button. In the Change owner to: list click on your User name. 6. Set the [x] Replace owner on subcontainers and objects check box. Then click on the [Apply] button. 7. Click on [OK] in each dialog box to dismiss them. Now you should have permission to perform any operation that you desire on the drive.